If you’ve been following my blog, you know I refer to EWG a bunch…I’m kind of obsessed. So when I heard that there was an EWG’s Skin Deep app for the phone, I immediately downloaded it. The best part is that it is FREE! 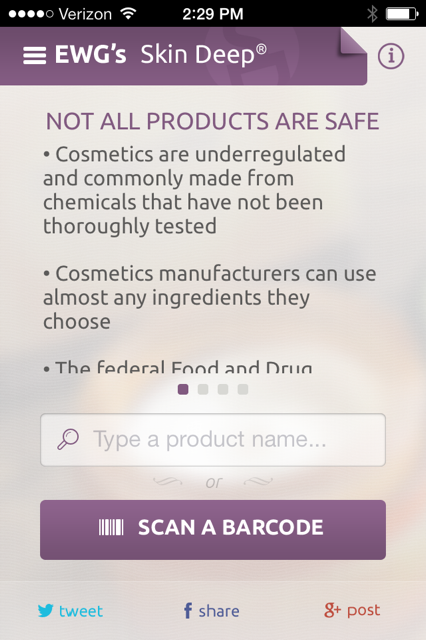 For those of you who aren’t familiar with EWG it is the Environmental Working Group – more specifically, the app is for their Cosmetics Database. Since the U.S. Government does not review product safety, EWG works to protect and educate us – they help us better understand labels and which ingredients to avoid. As stated right on the app, “The federal Food and Drug administration cannot require safety tests or recall harmful products.” Scary. They make it super easy to navigate their site (the app is just as easy) – you can search by a specific product, company, ingredient, or a generic search like “toothpaste.” A list of results will appear with their ratings from Low Hazard (0-2), Moderate Hazard (3-6), or High Hazard (7-10). When you click on each result, their will be a detailed outline explaining the rating it got and which ingredients are cause for a higher hazard. Now, back to the app! You have the option to do a search just like the website, OR scan a barcode. If they do not recognize the barcode, you receive a message stating that they are uploading the barcode for further research and to check back. How handy is that?! Makes shopping easy and convenient! Did I mention that it’s free?!? So go download it! For those who would like to learn more about EWG’s Skin Deep, click on the link below. 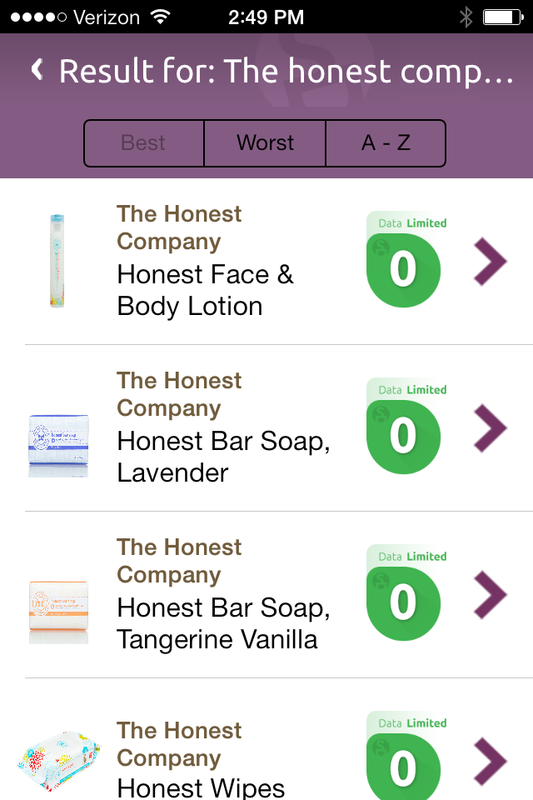 Here I did a search for The Honest Company…as you can see, this is why we choose them over other brands for diapers, wipes, soap, and more!